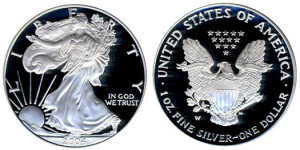 This page will cover the 2004 through 2009 releases of American Silver Eagles, and provide information about each edition of the coin. 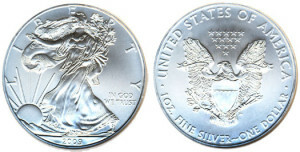 The 2004 American Silver Eagle coin was minted within a range of 8 million coins and showed only a small increase from the 2003 American Silver Eagle coin’s production. The US Mint offered these coins as the standard silver bullion to the network of collectors and authorized bullion dealers they work with. In addition to this inventory, the US Mint offered a high quality cameo finished proof of the 2004 American Silver Eagle coin. These proofs were made available to collectors on April 27, 2004 and the US Mint allowed a mintage topping off at 850,000. This indicated a 100,000 increase from 2003 and the coins were priced at a slightly higher amount: $27.95. This increase in price was only the third rise in cost since 1986 when the American Silver Eagle coin proofs were first made available. The other two price increases were in 1987 and 1988. 2004 saw an increase in the average price of silver at $6.67 per ounce and twice during 2004, the price per ounce rose above $8.00 per ounce. In 2005, the American Silver Eagle bullion coins boasted a mintage of 8,891,025, which was slightly higher than the mintage amount in 2004. This steady increase over the past few years indicated a steady and historical increase in interest and sales. As the sale of precious metals gained in popularity, the increase in price supported its growth. The 2005 American Silver Eagle coin’s proof was made available for sale on March 15, 2005, which was a few weeks earlier than most release dates in prior years. The US Mint allowed an unlimited mintage of these coins in 2005 and set the price at $27.95. The increase of mintage over the prior years led up to this unlimited offering. With the availability of coins and the earlier release, the 2005 American Silver Eagle coin boasted the highest sales levels since 1987. The year 2006 was the twentieth anniversary of the release of the first American Silver Eagle series. The U.S. Mint issued a collectible proof version and standard bullion version of the Eagle in 2006. This was also the introductory year for a second collectible coin version, and there were special sets offered to commemorate the twentieth anniversary. Corresponding with the price of silver, the bullion version of the 2006 coin saw a higher mintage, with a final mintage reaching more than 10.6 million coins. This was the third time that the mintage went past 10 million and was the second largest mintage for the series. Mintages seen in 2008 and years that followed would overshadow this level, however, due to an increase in the interest in precious metals. 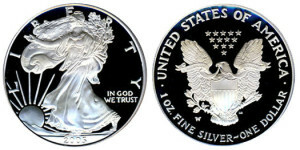 The 2006 Proof Silver eagle was released early in 2006, followed by the 2006 –W uncirculated version of the Silver Eagle, as well as a 2006 Reverse Proof Silver Eagle and a standard version of the proof. This three-piece set was limited to a quarter-million units and sold out in around two weeks. With the sales of the anniversary set, the final mintage of 2006 proof Silver Eagle coins was nearly 1.1 million, which was second in mintage volume only to the 1.4 million coins minted for the inaugural year of the series, 1986. Notably, this was the first year that the series was minted at the West Point Mint, and thus, carried the “W” mint mark. The production of 2007 American Silver Eagle coin saw a slight decline when compared to the previous year. The final mintage of just over 9 million coins would mark the last time that the mintage for the series would fall short of 10 million annually. In the years to follow, economic uncertainty would cause an increase in the demand for silver bullion, and higher levels would be produced. 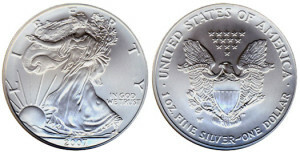 The U.S. Mint would also release two different version of the Silver Eagle for collectors in 2007, including a proof silver eagle priced at $29.95 per coin, which was an increase of $2 when compared to 2006 prices. 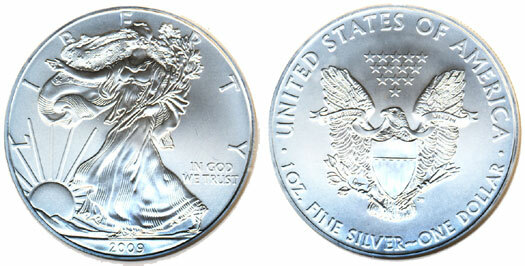 The second release was the 2007-W uncirculated Eagle. This coin was struck on a burnished blank and carried the mint mark “W” for West Point Mint. The price of silver traded at nearly $16 per ounce for a short time in 2007, but averaged $14.76 per ounce for the year. 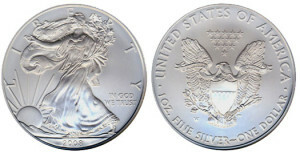 The 2008 run of the American Silver Eagle mintage nearly doubled to previous record. A sharp silver price increase and the increased global demand for precious metals due to the financial crisis caused a big increase in the number of coins minted in the American Silver Eagle series. In fact, demand was so vast that the sales of bullion were suspended during one point during the year, only to resume under ration. Rationing and period suspensions for silver bullion coins would follow in the years to come, too. The uptick in demand for silver and other precious metals impacted collectible coins as well. The proof for the 2008 Silver Eagle sold out in August, which resulted in a huge jump in the price of the coin on the secondary market. This sellout occurred early on due to the U.S. Mint using all of the incoming silver blanks to produce bullion coins. Under federal law, public demand for silver bullion coins must be met first prior to collector coins being struck. 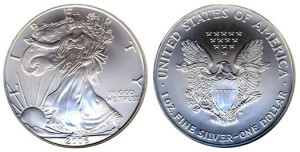 As in previous years, an uncirculated Silver eagle was also offered. 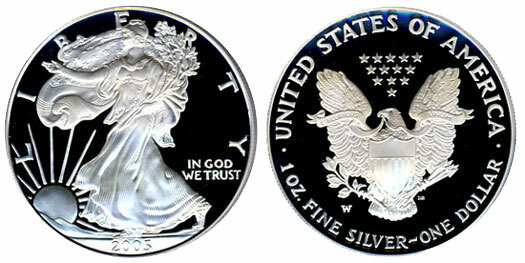 Many of the same issues and problems that impacted the American Silver Eagle series in 2008 were carried over to the 2009. This 2009 series saw high demands for precious metals around the globe, which cause a continual shortage of silver blanks for the U.S. Mint. This impacted both offerings of bullion coins and collectible coins. The bullion coins were subject to ration rules under the previous allocation guidelines. Those who were authorized to buy the coins could only buy a certain number. This rationing lasted until midyear when full demand was met, although renewed demand resulted in a brief suspension of coin sales until the fall. Sales of coins resumed in November of 2009, when the allocation guidelines were put back into use. The 2009 proof Silver Eagle and 2009-W uncirculated Eagle were canceled for the year. This was the first time in the series that the collectible version was not issued. A record mintage high was set for 2009, with nearly 30.5 million Silver Eagles being minted for the year.